A special treat for the many provincial civil servants who took Monday to relax, and get completely blotto, in honour of their English heritage. This map shows the proportion of "English" as a response, among multiple responses, to the ethnicity question on the 2006 census long-form questionnaire. The darkest reds represent the highest proportion of respondents claiming English as one or more of their self-described ethnicities, while yellows, greens, and blue indicate progressively smaller proportions claiming English as an ethnicity. A colour key is located in the bottom left-hand corner; click the map to massively embiggen. Nunatsiavut communities (other than Nain) are aggregated in order to be able to map them at this resolution; the Nunatsiavut portion of the Labrador map is given their collective colour. Three of the four were in the 20% "English" range, while Hopedale was just under 17%. This map, as with previous ones in this series, is mapped at a Census Division level of detail. 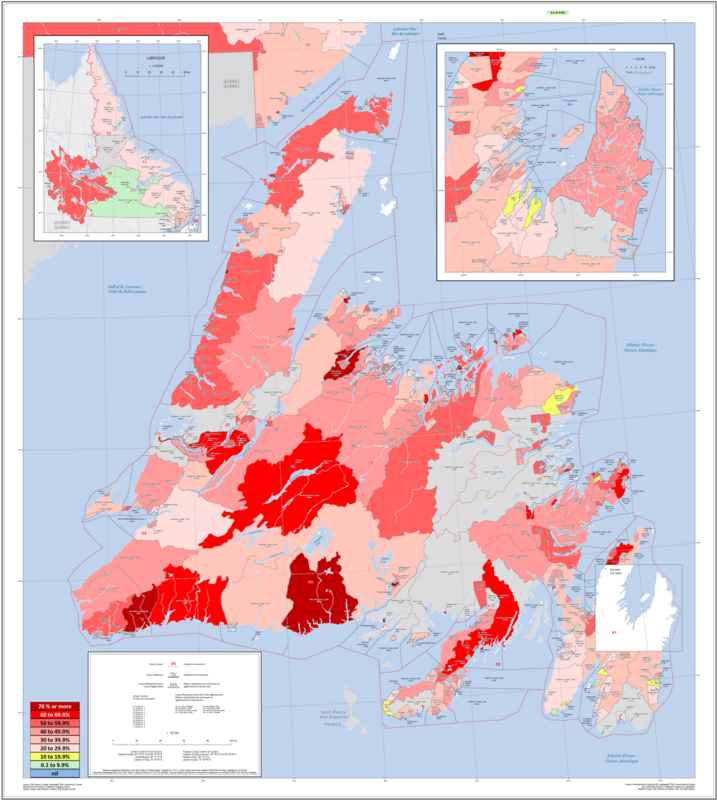 A comparison to the Irishness map in particular is instructive: the parts of Newfoundland that are self-identifiedly Irish are very, very Irish, but even within them there are English undertones. While there are large swathes of the province with very little self-identified Irish ethnicity, there are only a few pockets, even on the Irish Loop, which are devoid of self-identified English ethnicity.